Atradius expects Britain to vote for staying in the EU in the upcoming referendum. The most at risk sectors would be minerals, transportation and financial services. The most vulnerable countries are Ireland and the Netherlands due to deep investment and trade ties, as well as Germany who depends on UK support in EU politics. An in-out referendum to determine the UK’s membership in the European Union (EU) will take place by the end of 2017. This was confirmed following a landslide victory of Prime Minister David Cameron’s Conservative Party in the May 2015 general elections. But this is more than a domestic issue as the UK economy is an open economy, especially connected with Europe. Europe is the UK’s most important trading partner accounting for 45% of the country’s exports and 53% of imports (see Figure 1). The relationship is strongest for goods of which about half goes to the EU compared to 35% of the service exports. In total, exports to the EU account for about 12-13% of UK GDP. With such deep economic relationships, a UK exit would also impact the rest of Europe. It is nearly impossible to predict what the impact on the UK, EU and global economies will be, not least because there are several outcomes of the EU-UK negotiations and referendum that produce different sets of risks. In Table 1, Atradius identifies the three most likely scenarios. We expect that Britons will vote to stay in the EU but our expectations may change following developments over the coming 12 months. Opinion polls in the UK show popular support for remaining in the EU rising since the peak of the sovereign debt crisis in 2011-2012 and fears over economic uncertainty will likely push a large portion of those still undecided to stick with the status quo. Most outspoken businesses and trade unions have so far stood in favour of remaining in the EU. Uncertainty in the lead-up to the referendum will already show negative consequences, including lower investment and more cautious consumer and business spending, high market volatility and more fragile GDP growth. This may be a major motivating factor for Britons to vote to stay in the EU to re-establish stable, robust growth. Risks to this outlook are the French and German elections coming up in 2017 which will reduce the attention that French and German leaders will pay to negotiation processes. This may lead to rushed negotiations to reduce the period of uncertainty and subsequently too little reform for a ‘yes’ vote. Another risk is who actually votes — it is possible that the majority who would vote yes do not actually go out to vote while the more passionate ‘no’ camp does. If the UK votes to leave the EU, then it is both in the UK’s and the EU’s interests to avoid disruptions to trade, but trade negotiations could take several years. A Swiss-style arrangement (2) is more likely than the FTA approach (3) since it benefits both parties. It would continue the majority of the economic benefits of the EU-UK relationship while allowing the UK to pursue popular, domestic political policies like control over EU migration. One downside of this outcome for the EU is that it could set a precedence of cherry-picking. Scenario (3) could give the UK more freedom to rebalance its economy towards more export-driven growth through trade with emerging markets. But in negotiations for bilateral trade agreements, the EU would have both priority over the UK and more leverage, making it a possibly disadvantageous gamble for Britain. In June 2015, Standard and Poor’s (S&P) changed its sovereign credit outlook on the UK from stable to negative, and the Confederation of British Industry (CBI) cut its 2015 growth forecast for the UK economy from 2.7% to 2.4%. Both agencies cited uncertainty over the referendum in particular. Uncertainty damages consumer and business spending as well as foreign direct investment (FDI) which weighs on UK jobs and growth. It is also terrible for financial markets that may see weakened sterling and asset prices and increasing volatility. Higher volatility explicitly related to Brexit concerns has not yet been a major issue for the FTSE 100 or sterling, but we expect it to increase as the referendum vote comes closer. Thus, the brunt of the pain will be felt from late 2015 to 2017. The uncertainty would also hurt EU businesses, but could become an even larger problem as political contagion could spread to other Eurosceptic parties in other countries. Uncertainty around the negotiations and referendum could affect all sectors leading up to 2017, but those sectors that are the most ingrained in UK-EU trade will see the heaviest impacts should any of the benefits of free trade be infringed upon. 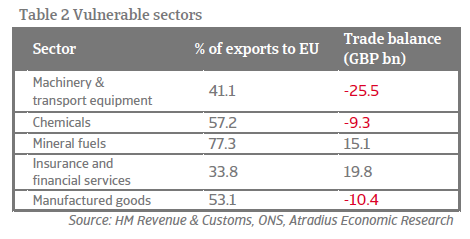 Table 3 presents the most vulnerable UK industries as judged by the percentage of its exports destined for other EU markets and its relative trade balance with the EU. 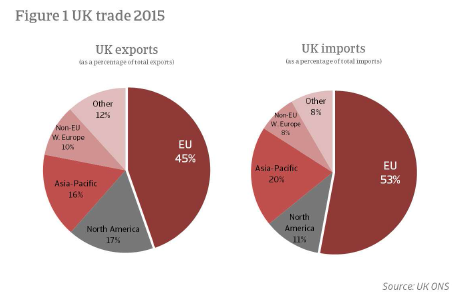 For most goods, the UK is a net importer from the EU. In the chemicals, mineral fuels, and manufactured goods industries, over half of its exports go the EU. With such large volumes of trade, any disruption will have an immediate impact. This would be felt especially strongly for oil and gas companies – part of the chemicals sector – which on average send over 77% of their exports to Europe. The UK’s automotive industry – a part of the machinery and transport equipment sector – accounts for 3% of British GDP. Beyond trade disruptions, the sector would lose benefits from EU funds for manufacturing research and development. It would also be felt in the rest of the EU with re-introductions of trade obstacles, possibly shrinking the German automotive industry by 2% for instance. The services sector, though, constitutes almost 80% of the total UK economy. London is a global financial centre and is the largest in Europe. About one third of insurance and financial services exported from the UK are sent to the EU and the UK has a trade surplus with the EU of GBP 19.8 billion. Trade negotiations for the services sector will be much more difficult than for goods. Therefore the sector is extremely vulnerable to changes in trade and more at risk to not having similar access to the single market. EU regulations would especially be an obstacle for retail banking and euro traders. But Brexit would not be a death sentence for the British financial industry – while some businesses will inevitable move to other financial centres in the EU like Frankfurt or Dublin, such a large network of financial and professional services would be almost impossible to replicate elsewhere. Those countries that have deep trade ties to the UK are also most vulnerable to immediate economic impact. Table 3 presents the five EU markets with the highest volume of trade with the UK. Ireland: Ireland is a small, open economy that depends on the UK for 14% of its exports and 34% of its imports. Beyond trade disruptions, the re-introduction of the customs border would impose new costs and lost time to cross-border transactions. On the flipside, Ireland could possibly benefit from larger inflows of FDI as foreign investors seek other access points to the Single Market (in case of Scenario 3). Netherlands: In terms of both volume and proportion of exports and imports, the Netherlands is the UK’s second largest EU trading partner. The country also has deep investment ties to the UK: the UK is the most popular destination for Dutch investors and the Netherlands is the second most popular destination for UK investors. Germany: Germany is the largest trade partner in the EU in terms of volume and Brexit would remove a lot of the benefits of the Single Market for German industry, especially the automotive sector. But as the EU’s largest economy with relatively low dependence on UK trade, it is less economically vulnerable. The political obstacles that Brexit would introduce for Germany in EU politics, however, would be high. One of the most far-reaching and unpredictable effects of Brexit on the EU is the shift in the union’s political balance. The UK is one of the largest advocates for liberal, freetrade policies in the EU and is a major ally of Ireland, the Netherlands, and Germany. This voting bloc would shrink and the influence of more protectionist countries like France could damage the EU’s global competitiveness. Having similar policy goals also means that the UK’s negotiations with the EU in the run-up to the referendum vote could benefit these countries. A reformed EU, most notably with more services trade liberalisation, would boost the Irish, Dutch and German economies among others. But if such reforms fail to keep Britain within the EU, these economies will all suffer. 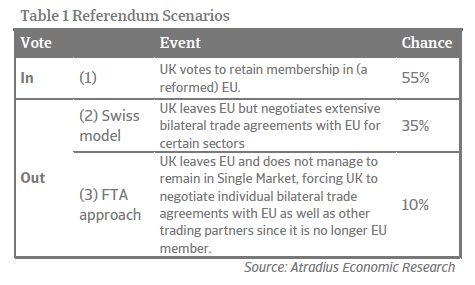 Atradius believes that Brexit is unlikely and that, should it occur, it will likely include favourable trade terms similar to the Swiss model. But the uncertainty surrounding the referendum may cause severe market volatility and delays in investment which could reduce economic growth in the UK, currently the powerhouse of the EU. In any case, sectors and countries that are heavily dependent on bilateral trade between the EU and UK must be cautious as any reduction in free trade or changes in regulation will increase costs. Among the most exposed sectors are the minerals, transportation and financial services sectors. The most vulnerable countries are Ireland, the Netherlands and Germany. In the case of Brexit, identification of these exposures of countries and businesses alongside good planning will limit potential disruptions.